Chapter 689: They Want To Kill Me?! He was a middle-aged man, and completely expressionless, with ice-cold eyes. There was also something cold about his raspy voice that pulled Bai Xiaochun out of his reverie. “Fellow Daoist Deathcrier, Fellow Daoist Cloudpeak, Fellow Daoist Redsieve, might I ask for your assistance?” A mere step took the man to a position above the Necromancer Kettle. As he did, Duke Deathcrier, as well as the two old-timers who had come with Zhou Hong and Xu Shan, nodded and followed along. Above the Necromancer Kettle, they all began to perform incantation gestures, causing ripples to spread out as deva power descended. Soon, intense rumbling sounds could be heard, and the Necromancer Kettle began to vibrate. More black mist poured out from inside of it, which then rose up into the sky. “After enough time passes for a single incense stick to burn, the Necromancer Kettle will open, and the lot of you must enter immediately. We four can only keep it open for the time it takes half an incense stick to burn, so therefore… don’t delay. Opening the kettle a second time would be very difficult. However, it will open automatically after the flower fully blooms. At that time, you’ll have only two hours to emerge, lest you face deadly peril!” The surrounding chosen immediately began to get nervous. Rotating their cultivation bases, they sized each other up, and many of them even seemed to be transmitting messages. Bai Xiaochun looked over at the Necromancer Kettle and considered trying to delay so that he would be the last one to go inside. However, he didn’t see how he could really do that with only half an incense stick’s worth of time to deal with. “Ah, forget it….” he thought, feeling a bit depressed. However, it was in this exact moment that he suddenly realized that something seemed very off. It was as if he were now the subject of dozens of gazes, a feeling which caused him to look around vigilantly. Countless chosen were all looking at him with thoughtful expressions, and gazes that were clearly filled with ill intentions. Even Zhou Hong, Xu Shan and Gongsun Yi were there in the crowd. Bai Xiaochun was starting to get a bad feeling. “So, they're actually going to team up,” he thought, starting to pant a little. As far as Bai Xiaochun could tell, if everyone attacked him at the same time, it wouldn't matter if he was stronger than he currently was. There were more than a hundred people here… and all of them had deadly trump cards at their disposal, such that they could cause a headache even to a deva. Not willing to be outdone, he quickly began to comfort himself and even work himself up a bit, “These people are all villains! What gall they have! I'm a mighty major general from the Great Wall, the famed majordomo of Giant Ghost City, a person who dares to fight with devas! I even kidnapped a demigod! How could I possibly be afraid of these people!? “On the other hand, I can’t bully them. Ah, whatever. I have a really high status, and am in the Heaven-Dao Nascent Soul stage. I shouldn’t lower myself to their level. This time, I really have to keep a low profile. I’ll just go in and take a look around, and definitely won’t get into fights with any of these kids.” Having reached this point in his train of thought, Bai Xiaochun was convinced that he had reached a higher way of thinking than these other chosen. Planting a benevolent smile onto his face, he nodded kindly back at all of the chosen. However, his smile didn’t seem to do any good. Not only did the gazes locked onto him not grow any less malevolent, some of the chosen, including Zhou Hong and Zhao Dongshan, even began to sneer at him. That immediately made him mad. After all, it wasn’t common for an incredibly powerful person like him to show such good will. And yet here these dogs went and turned their noses up at him! “This is outrageous…. Ah, whatever. Just forget about. It’s not a big deal. There’s no point in bickering with them.” Saddened, he decided to simply endure the situation, and was just about to look away, when suddenly, a chill ran through him! As of this point, he could sense killing intent within the eyes of the people looking at him…. Not all of these chosen were adept at hiding their true intentions, or perhaps it was that they didn’t feel they needed to. 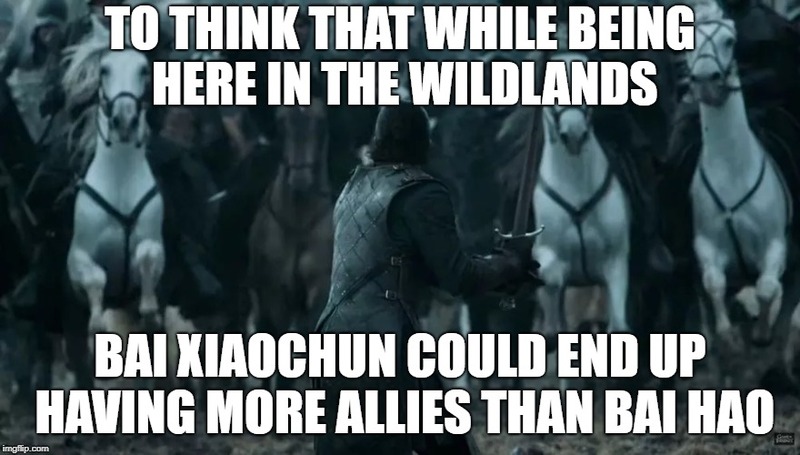 Either way, Bai Xiaochun could clearly sense how much they wanted to kill him. “They want to kill me? !” His heart immediately began to thump. Although everyone had come to fight over the Ghost King Orchid, and he was here on behalf of the Giant Ghost King, he had always thought that simply refraining from the fighting would make the entire thing much less dangerous. But now, with so many people staring at him with killing intent, he suddenly felt the need to be completely on guard. The truth was that Bai Xiaochun’s instincts were correct. Although not every single last one of these chosen wanted to kill him, many of them did. Of course, it wasn’t anything about him personally. However, all of them knew that he was not anyone important in the current dynasty; he was nothing more than one of the Giant Ghost King’s subordinates, and therefore, he was someone they would naturally dare to kill! Killing him would be the easiest way to resolve the biggest issue they all faced. With Bai Xiaochun out of the picture, the matter of who got the Ghost King Orchid fruit wouldn’t be as important, at least, not unless the Giant Ghost King had made other arrangements. As for which of the other heavenly kings got the fruit, it didn’t really matter. Any of them could trade it to the Giant Ghost King. Furthermore, it didn't really matter which of the other chosen got it, although whoever did would surely benefit in some way. Everyone knew that killing Bai Xiaochun would offend the Giant Ghost King, and normally speaking, they would be worried about that. But in this situation, all three of the other heavenly kings were working together, and their combined power ensured that even if the Giant Ghost King got angry, he wouldn’t be able to do anything about it. Everything came down to karma, and everyone knew that the four heavenly kings didn’t really get along with each other. Besides, when other secret treasures had appeared in the Wildlands in the past, the kings would always fight over them, and on more than a few occasions, the Giant Ghost King had come out on top. Therefore, the fact that this incredibly important Ghost King Orchid had appeared ensured that the other three kings would take advantage of the situation to strike a blow against the Giant Ghost King. When it came to the struggles of demigods, chosen like the ones present today would view Bai Xiaochun as a nobody who could be killed at will. As the second prince stood there, he pondered some of the advice he had been given. Although he didn’t plan to refuse the advice, in his heart, he was chuckling coldly. Nowadays in the Wildlands, the Arch-Emperor was weak. The Grand Heavenmaster controlled the Son of Heaven and the nobility, and the four heavenly kings were not devoted heart and soul to protecting the dynasty. Therefore, one of the second prince’s priorities were looking out for his own interests and solidifying his own power base. For example, this arcane pocket realm was one of eight that specifically belonged to the imperial clan. And yet, a single order from the Grand Heavenmaster wrested it into the public domain for countless people to struggle over. Considering his status, the second prince hated both the Grand Heavenmaster and the four heavenly kings. Therefore, the infighting among the four kings was a good thing as far as he was concerned. However, the one person who he felt uneasy about was Chen Manyao. She stood there next to the second prince with a cool expression on her face, as though nothing which was going on held any interest to her. She was here on the orders of her Master to acquire the ghost king fruit; anyone who acquired the fruit before she did was to be viewed as an enemy. It didn’t take long for half an incense stick’s worth of time to pass. During that time, Bai Xiaochun’s thoughts began to race faster and faster as he became convinced that there were people here who wanted to kill him. “At least it’s not everybody, only some of them…. Besides, if I did get killed, then the Giant Ghost King would die too; there’s no way he would send me to my death….” Even as he frowned over the matter, the time limit passed, and rumbling sounds echoed out. As of that moment, the mist stopped pouring out of the Necromancer Kettle, and within the black mist that did exist around it… a tunnel appeared! Instantly, Gongsun Yi and Zhou Hong shot into motion, followed closely by others. As for Bai Xiaochun, he sighed and then sped into motion. “I need to catch them off guard and make sure they don’t have a chance to join forces. That’s the safest way to play things.” Gritting his teeth, he accelerated into the tunnel that led to the Necromancer Kettle. Although the tunnel appeared to be very long, upon entering it, the chosen all vanished, including Bai Xiaochun. Moments later, they appeared in the world inside of the kettle! A gray, overcast sky could be seen up above. The land was violet, and black mist floated everywhere, within which could be seen countless evil ghosts. From the sinister looks in the eyes of the ghosts, they were just waiting for people to pounce on. Stifling pressure weighed down everywhere, causing a sense of profound danger to rise up in the hearts of the various chosen. It was just barely possible to see mountains rising up around them, and further off in the distance, an enormous basin! That basin was covered with a thick conglomeration of mist that formed into a flower that looked exactly like the Ghost King Orchid outside…. The flower was clearly in the middle of blooming, and needed a bit more time to complete the process…. Hey everyone, I've decided to change the capitalization convention for a few titles. I won't list them here; you'll probably notice right away what I've changed. By way of explanation, my general rule is that titles which multiple people could or do hold are not capitalized except when used as a form of address or with a name. A good real-world example is the title president. There are many presidents in the world, both of countries and companies, so normally I would use the title lower-case. So, Donald Trump is the president of the United States, but would be referred to as President Trump. In my translation, titles such as patriarch, elder, sect leader, etc. fall under this rule. But for some of the Wildlands titles, I've been wrestling with the subject for a while now. What finally changed my mind about how to treat some of those titles was that legendary figure from the Heavenspan River region, the Celestial. After all, there is only one "Celestial" in the world, so it makes sense to me for his title to be capitalized and treated almost like a name. But what would happen if he eventually died, and someone succeeded him? It would make sense for that person to also be called the Celestial. Perhaps he would be the second generation Celestial. That, in turn, led me to think about people like the Giant Ghost King. Although the Giant Ghost King in the story is not the first person to hold that title, I think it's safe to assume that the very first one was unique in the world, and that it would be proper to use his title in upper case like a name. It also makes sense that subsequent bearers of that title would be treated the same. One thing that makes this hard is that there is no such thing as capitalization in Chinese, so we translators have to use our own judgement about what to capitalize. Another big thing that played into my decision was the fact that translators do not have any global search-and-replace ability on Wuxiaworld. After all, a global search-and-replace can go wrong very quickly if you aren't careful. So making a change would require a lot of manual work. Yes, I know I could just change it with new chapters, and ignore previous chapters, but my picky nature made that a very undesirable option. So I hounded the WW technomancer to help out, and went ahead and got a global search-and-replace done to change all instances of all the titles affected. I think the changes might take a while to become visible site-wide, but the process should be completed within the next couple hours. If you see any locations after that where formatting or other mistakes cropped up during the process, please do let me know!